Linux is a unixoid operating system that has taken over the characteristics of the big UNIX systems, whose birth probably 1965 in the development of Multics (Multiplexed Information and Computing Service, literally: Bundled information and computing). In 1970, the project name Unics (Uniplexed Information and Computing Service) was generated. This resulted in Unix and from 1974 the spelling UNIX. 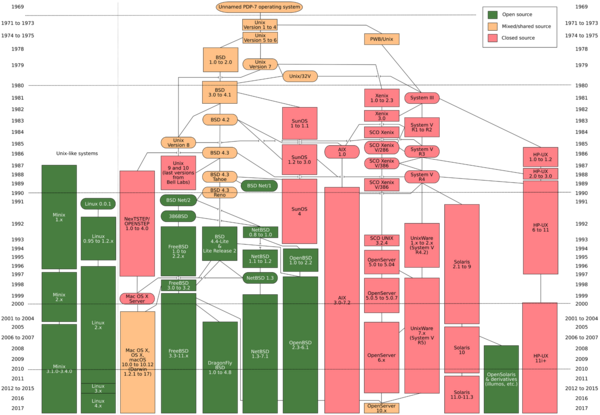 As of 1977, the University of California at Berkeley published its own Unix distribution: Berkeley Software Distribution (BSD) and AT & T published in 1979 the last UNIX version with free source code, namely UNIX V7. From now on, a commercial marketing of UNIX definitely started, so in the end, every hardware manufacturer made its own UNIX hardware: AIX, HP-UX, Irix, Xenix. The most important difference of Linux compared to the commercial UNIX systems is the licensing model. Namely, Linux may be completely freely copied and distributed together with the complete source code. A central role is played by theGeneral Public License (GPL), which regulates the conditions under which Linux may be distributed. Only through the GPL does Linux become the free system that it is today. An operating system is understood to mean a whole package of individual programs that first realize the operation and the functions of a computer. It manages the interfaces between man and machine: in detail, keyboard, monitor, mouse, peripherals are managed. In addition, system resources such as CPU time, memory, processes etc. are managed. Only a fully functional operating system allows the start of application programs and the storage of own data in files on different data carriers (hard disk, floppy disk, USB stick, SD card, network drive, magnetic tapes, etc.). Long before Windows, Linux and Apple OS X, as shown, existed UNIX with features that were far from Microsoft until the 1990s. This means true multitasking, the separation of processes from each other, clearly defined access rights for files and directories and really sophisticated network functions. However, Unix initially had only a spartan user interface and was very sophisticated in terms of hardware, which fueled commercialization. This is the starting point for the Linux Kernel release on October 5, 1991 by Linus Thorvalds. Strictly speaking, the term Linux only stands for the kernel. However, the kernel contains all the individual programs of an operating system for controlling hardware, memory and processes. While most of the computers on sale still include Windows and Apple macOS is very popular, today large parts of the Internet (such as Google) are supported by Linux. Linux is found on most servers on the Internet again. You can find Linux in the form of Android on smartphones, tablets, embedded devices (routers, NAS hard drives, navigation devices, automotive) and on supercomputers. Even Apple macOS and Linux are related. So Steve Jobs had after his ejection from Apple in his company NEXT with NeXTStep (later OPENSTEP) derived a BSD operating system. That's why you can still find Unix and a Bash-Shell under UNIX-commands under the nice graphical user interface. Unfortunately, only a few Apple users know this. This is a blessing for Linux administrators, as they can easily manage Apple computers without having deep knowledge of Apple.